Lulu James, Director of COTTONTAILS, a non-profit rabbit welfare organisation, met Chris and Lorraine Platt, founders of the Conservative Animal Welfare Foundation, at Portcullis House on 18 December. 1. There are approximately 1.5m pet rabbits in the UK (PDSA, 2016). 2. Rabbits are the third most popular pet after cats and dogs. Sadly, they are also the most abused, according to the RSPCA and many other animal charities. 3. At least 67,000 rabbits are taken to rescue centres every year (RWA). Many more are abandoned or die of neglect. 80% of pet rabbits bought at Easter die within a year due to neglect, predators’ attacks and undetected illnesses (survey by rabbit welfare organisation Make Mine Chocolate). 4. Rabbits are the most difficult pet to rehome, according to 150 animal shelters (survey by Cottontails). 5. Contrary to stereotype, rabbits are not inexpensive, low-maintenance pets, they can be as much work as caring for a dog. They are intelligent, athletic and sociable animals who love to run, jump, play and explore. Being sensitive creatures, they are frightened by excessive noise and activity so are not a good choice for families with small children. 6. Rabbits like to sit next to you to be petted, but rarely enjoy being picked up and held as this is what a predator would do. Children like a pet they can hold and carry around. 7. 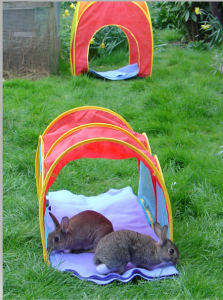 Most children lose interest in their rabbits within a month of purchase (House Rabbit Society). 8. Rabbits can live 10-12 years. 9. The average hutch on sale in pet shops measures just 90-120cm X 30cm X 30cm (3-4ft X 1ft X 1ft). Traditionally hutches were used to house meat rabbits for just a few weeks. Most rabbits end up spending their whole life in a hutch once the novelty wears off. Unlike cats or dogs, they cannot complain – in the wild noise would attract the attention of predators. 10. Wild rabbits cover an area equivalent to 6 football pitches every day. The instincts and needs of pet rabbits are the same as those of wild rabbits. 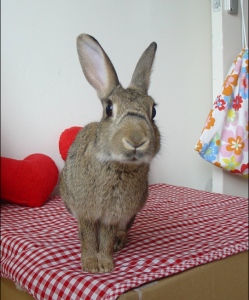 For more information please visit Cottontails’ website at http://bunny.org.uk or email mail@bunny.org.uk. Would you keep a cat or a dog in a hutch? Cottontails believes it is equally cruel to cage companion rabbits and that they deserve a better life.